If anybody believes that classic American music, that called Standard, should solely be associated with such legends as Frank Sinatra and Tony Bennett, one has probably not heard Michael Steven Buble singing. The thirty-two year old Canadian nugget has already conquered millions of hearts all over the world and won several prestigious awards for his albums and singles. His second album It's Time has made Michael Buble one of the most successful classical pop performers to date, and this year he is proud to present his third studio creation Call Me Irresponsible. 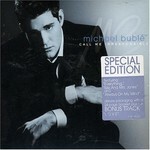 Just as the two previous albums this one is recorded in the genre's best traditions: the bulk of Call Me Irresponsible consists of classical well-known compositions as perceived by Michael Buble, and besides the album offers the crooner's two original songs and invites the listeners back into the charming world of the forties, fifties and sixties. Flawless as they may seem the singer's vocals are even more felt on the new record proving once again that there is always room for perfection. From the very first sounds of the album it is quite clear that everyone who has taken part in its creation have had an intention to outshine everything done before. Producer David Foster and Michael himself have done a great job. The opener The Best Is Yet To Come is a cover of Tony Bennett's hit, which has obtained a new sense in Buble's performance. An Italian composition It Had Better Be Tonight (Meglio Stasera) is familiar to all for us for its feturing The Pink Panther series, and Me And Mrs. Jones is a brilliant jazzy variation of another legendary song. One of Michael's original creations Lost is devoted to failed relationship and is sure to stir the heart strings of the hardest listeners. Comin' Home Baby is a duet with Boyz II Men, which is quite a surprise for R&B fans, and the title track Call Me Irrespobsible more than deserves its status. One of the album's highlights is the splendid performance of I'm Your Man, a witful love composition, and Eric Clapton's famous ballad Wonderful Tonight have gained new unusual features as it is a duet with Ivan Lins, a Brasilian artist singing in his native Portuguese. The other song written by Michael himself is Everything, the first single off the album, amazing with tender tune and lyrics. Always On My Mind is again a brilliant cover of an eternal hit, and the final song Dream ends this marvelous journey to the past right in the middle of the forties. Despite the album being so filled with covers, it is impossible to accuse Michael of lack of imagination or individuality. The thing is he really enjoys singing all the songs chosen for Call Me Irresponsible and wants to share his ideas of how they can sound. The impression in most cases is that you are actually listening to new compositions and sometimes it is at first even hard to recognize the song. Jazzy improvisations, great orchestra accompaniment, together with Buble's unforgettable vocals make each of his works a worthy representative of classical pop music rightfully deserving all their awards. Michael's live shows only confirm this. His magnetic charm and ability to hypnotize the viewers with singing have already become a legend and people all over the world cannot wait to see him performing at their towns and cities. On Call Me Irresponsible the Canadian crooner demonstrates his ability to change the manner of singing from the most complicated combinations of notes to quite simple moments, and this dynamics is not to be ignored. Still, all the advantages of the album can be conceived only on listening to it carefully and more than once.